John doesn’t expect Michael to be as weirdly taken with the ocean as he is with the wild woods. It doesn’t seem like his element the way the trees are. But he is mesmerized by the beach almost instantly upon their arrival, insisting they walk along the hard wet sand of the tide line. It doesn’t matter how many times John says their muscles will ache unhappily tomorrow from miles walked at the edge of the frigid fall water; Michael either doesn’t hear him or doesn’t care enough to respond. John is fascinated as Michael keeps a close eye on shells and rocks. One is shaped like a small egg, and he’s disappointed when it’s not. Still he makes John hold it for him, running ahead to a rock jetty to comb through the midden of mussel shells left by persistent and angry seagulls. John tries not to be horrified, but the sight of Michael’s fingers picking through the dead bivalves and seaweed stinking in the sun is a bit much. “What’s this?” Michael asks, eventually, holding out a shell, colored and swirled, to him. It’s in perfect condition, and John is about to be impressed with the find until he realizes there’s still a creature using the shell as its home. “That’s an animal in there.” He doesn’t actually know what kind. But it’s gelatinous and of the sea and not really a thing they should be messing with. They’ve seen dozens of jellyfish washed up on the beach already today. “Ocean,” John says. He’s not 100 percent sure, but he suspects, like the jellyfish, the sun and the birds will eventually cook and peck it to nothing if it’s not saved by the sea. Michael throws the shell back and returns to the tide line as they walk, gaze carefully on the ground and picking at every shell he sees that looks like whatever creature he just rescued. Most of them have their animals in them, and John suspects the coming hurricane that’s going to ruin their trip is churning them up. As Michael throws each one back into the water, John is charmed that he’s trying to save creatures that have no spine, names he doesn’t know, and forms he’s never seen before. Eventually Michael decides they can leave and reaches for John’s hand. John flinches away. It’s not the strangeness of the town this beach is attached to, half religious meeting town, half gay beach paradise. There’s even a club down the block from their inn that advertises “Less Lights, More Fun!” It’s that he can only think about whatever bacteria Michael is now coated in from all the dead mussels. God, but he’s going to look like an idiot explaining that. When he tries, stumbling through a mini monologue about seaweed and sea creatures and sand, Michael just listens with his head tipped to the side. Finally John’s speech drags to a halt under Michael’s incredibly unimpressed gaze. He sighs and starts again. It’s sharp, but John knows he probably deserves it. “You know I don’t mind being out in public with you,” he says cautiously. He wants to be honest with Michael, but he also doesn’t want to provoke anger by being less willing to be out than Michael deems sufficient. John lets out a relieved sigh and wraps an arm around Michael’s waist. He wants to prove his willingness to be fully in this relationship without shame, but life is also just better when they’re touching. Michael leans into his side, and they start walking down the sand again. “So how did you come out to your parents?” John asks after they walk for a few minutes in silence. “Yeah,” Michael says, drawing the word out in a way that makes it clear it’s his turn to be defensive and weird. John smirks, pleased to be off the hook for the moment. “You haven’t told them about us either,” he says smugly. Michael mumbles something against John’s arm. Erin McRae is a queer writer and blogger based in Washington, D.C. She has a master’s degree in International Affairs from American University, and delights in applying her knowledge of international relations theory to her fiction and screen-based projects, because conflict drives narrative. Racheline Maltese lives a big life from a small space. She flies planes, sails boats, and rides horses, but as a native New Yorker, has no idea how to drive a car. A long-time entertainment and media industry professional, she lives in Brooklyn with her partner and their two cats. Together, they are co-authors of the gay romance series Love in Los Angeles, set in the film and television industry — Starling (September 10, 2014), Doves (January 21, 2015), and Phoenix (June 10, 2015) — from Torquere Press. 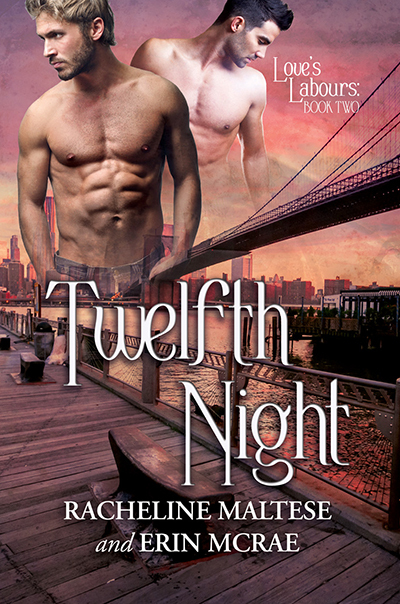 Their gay romance novella series Love’s Labours, set in the theater world — Midsummer (May 20, 2015), and Twelfth Night (August 12, 2015), is from Dreamspinner Press. They also have a story in Best Gay Romance 2015 from Cleis Press and edited by Felice Picano. You can find them on the web at http://www.Avian30.com. This entry was posted in For Your Reading Pleasure and tagged Book Blast, Contemporary, MM Romance, Pride Promotions by Charley Descoteaux. Bookmark the permalink. Custom banners and artwork designed by A.J. Corza. Photos licensed from Depositphotos, Thinkstock, Shutterstock or Graphic Stock, or taken by Charley Descoteaux, unless otherwise noted. This blog is hosted by WordPress.org. Cookies are stored in compliance with the WordPress policy. We do not use any data received via the Comments section or the Contact Form for the purposes of marketing or promotion. Anyone wishing to have their data removed can contact the blog using our Contact Form and it will be done. We have never and will never sell or distribute your information to third parties.